The behavior of liquid molecules, confined in nanometerscale spaces or at solid—liquid interfaces, is quite different from that in the bulk, which is attributed to the surface-induced structuring of liquids. The structuring of liquids at solid—liquid interfaces was investigated by employing new approaches based on surface force measurement. 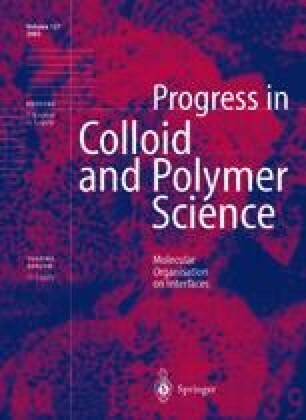 The combination of surface force measurement and Fourier transform IR spectroscopy in attenuated total reflection (ATR) mode revealed a novel hydrogen-bonded molecular architecture, macroclusters of alcohol (e.g., ethanol) and carboxylic acid (e.g., propionic acid), on silica in cyclohexane. The ATR spectra showed that alcohol (or carboxylic acid) adsorbed on the surface formed macroclusters even in a low alcohol concentration such as 0.1 mol%. The spectra indicated that the cluster formation of alcohol involved hydrogen-bonding interactions between surface silanol groups and alcohol hydroxyl groups and those between alcohol hydroxyl groups. The force measurement demonstrated long-range attraction extending to 30–40 nm, which could be explained by the contact of opposed adsorption layers of alcohol on the surfaces. Similar results were obtained in the cases of carboxylic acids. This phenomenon was used for preparing polymer nanofilms on solid substrates. A shear-force resonance method was developed in order to examine in detail the ordering behavior of liquid (liquid-crystal) molecules confined between two mica surfaces. The frequency and the amplitude of the resonance peak are highly sensitive to the long-range order within the confined sample, affording information about the liquid structuring from the surface to the bulk at the nanometer level. This measurement was used to study 4-cyano-4′-hexyl biphenyl confined between mica surfaces.